Lately, I’ve been feeling a desire to do some cleaning and rearranging in bigger areas too. It’s as if all the walls in my life are filled with treasured artwork. I love each piece but I need to take each one down, and see how it might look on a different wall in order to fully appreciate their beauty again. I want to admire the lovely paintings in my life. I don’t want them gathering dust and simply taking up space. I don’t want to wake up one morning and realize the beauty has disappeared and all that’s left is clutter on the walls. The other day I saw this picture posted on Facebook. 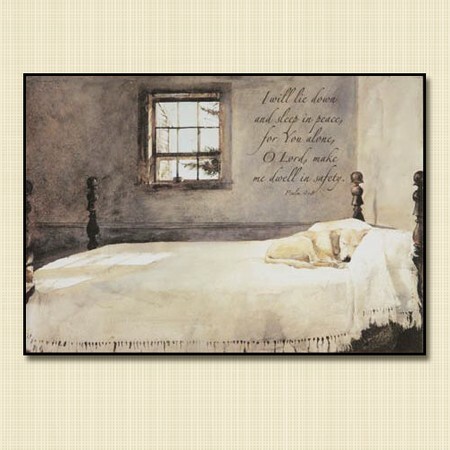 The verse is Psalm 4:8 “I will lie down and sleep in peace for You alone, O Lord, make me dwell in safety.” I have had this picture (minus the Bible verse) hanging in my living room for over a decade. It’s by Andrew Wyeth called “Master Bedroom”, and it’s one of my favorites. Yet, seeing the picture with the verse added to it brought new life to the picture. This year, I want the art in my life to come back to life. Like one my favorite scenes from the CS Lewis book The Voyage of the Dawn Treader, art that is alive will take you on the most beautiful adventures! This entry was posted in Uncategorized on January 6, 2013 by Eileen. Hi Eileen, I’m also feeling this sense of enjoying my life, of shaking out the dust and bringing the colour out. Great post. Maybe becaused we have moved so much and lost a few thing I treasured I have learned to use what ever is available. I so have one picture I bought about 30 years ago and it has been stored through the years overseas. I brought it with me this last move and it’s a comfort to seeing it hanging over my couch. Change does give us a different prespective on things even if it’s just moving a picture to a different room. Good post.